As a Roma from Slovakia, Igor believes that education may be the only hope for changing the future of his community. They have faced racism, discrimination and even violence that targets ‘gypsies’. Educating Igor gives an insight into the isolated, impoverished world of Slovakia’s Roma community. Often excluded and derided as “gypsies” this is the story of Igor and his sister, Irma and their efforts to use education to change the future for the children in their community. 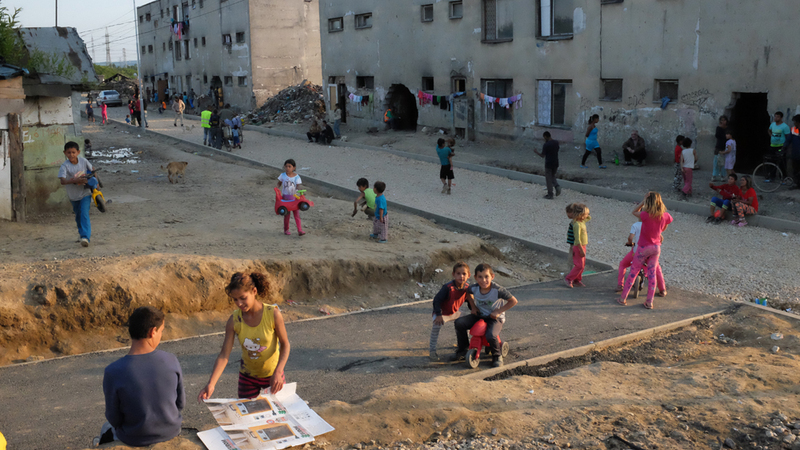 From the moment we entered the Roma settlement of Budulovska in Slovakia, our perceptions were challenged. There are 800 Roma there with one main water tap for the majority of the inhabitants. They have to make daily trips to fill up big water bottles. Their access to electricity is limited. And when we first arrived, there was no standardised rubbish collection. Most in the community are unemployed, though a few do contract work. At first glance it was a grim picture with lack of amenities, discrimination and a history of victimisation with which the world is all too familiar. Then we met Igor and Irma and this is where the story truly began. They did not see themselves as victims. This was their home, their community. And as they showed us around and talked, they projected not just their reality but also their hope for a better future. This is where our film began. We knew Igor’s story from reporting by a local journalist, Ben Cunningham who often covers the issues facing Roma in Eastern Europe. However, our team wanted to know what really made him decide to give up substance abuse and seek to finish his education. In 2013, Igor was beaten up by the police and arrested. Was this really the only catalyst? As we dug deeper we began to see the strong family ties and support within the settlement. We met Irma, his older sister, who had managed to get an education and move out of the settlement. While she lives outside in a flat three kilometres away, her life is still very much in the community. Every day she walks to the community centre and brings her skills and knowledge back as she runs classes for children preparing them for outside the settlement. We saw the support that Irma gives Igor, her other siblings and people in the community. When we were there in early May, the dirt road was riddled with puddles of rainwater that the children played in. When we returned in June, the road had been paved and the rubbish removed by the new mayor and his administration. Irma said it had taken 20 years to bring this change. And even though the drains were not working yet, she knew they had achieved victory. Irma’s determined support for Igor to build a new life was equally impressive. He has found the strength to travel two hours each week to Hungary to study for his high school degree and be in a class with 15-year-olds. The transformation in his life enables others in the community to change as well. The fact that Igor still sleeps with five other relatives in a bed and rarely has water to clean his clothes, is still the reality but one he wants to change. Educating Igor gives an insight into a changing community despite the odds and obstacles. Igor and Irma are improving not only their own lives but also their community, especially the next generation. They are proud of their Roma history and heritage and want their community to be empowered to make their own future. As Igor said, nothing will stop him now and I believe him.